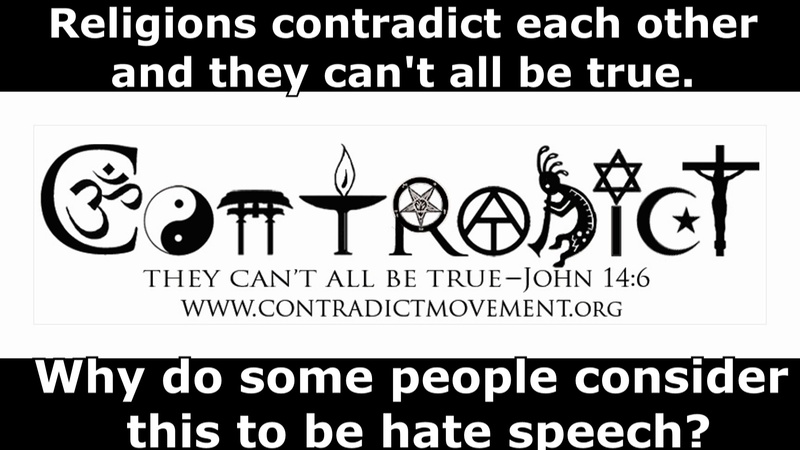 I posted this image to Facebook and almost instantly I received a question about who considers Contradict to be hate speech. Also most sites where this image has been posted have responses from naysayers asking why Christians have to hate other religions and why we can’t accept them all and have tolerance? Like the guy admits in the quote they want to willingly stay in ignorance, and in actually they’re lashing out and calling you the “hater” because they know they have no ground to stand on when it comes to their claim that “truth is relative”. Most people result to name calling and labeling when they’re exposed, and when the call you the “hater” they’re actually projecting what they are and what they feel toward you. Check out Contradict Movement! You can watch videos, get linked to Facebook, get access to free group study guides, and even better, order stickers, shirts, mugs, magnets, and cell phone covers adorned with the Contradict logo. Previous Post What do all religions have in common? Next Post Buddhism’s 3 Marks of Reality and 4 Noble Truths! You said you created the sticker with memes. Please tell me how / share link. I’m working on a RELIGION vs. TRUTH sticker. "I am surprised we can not watch the debate itself streamed on youtube. I would suggest that you stream the Reiaplbcun debate comming up." My thoughts exactly. At least link us to the CNN live stream.